rocky's bru: What are you not telling them, Arul? BBC is known for its hard talking journalists. But you gotta like how 1MDB boss Arul Kanda handles the questions. BBC reporter: "It's not just the Malaysian authorities that are investigating 1MDB. There are also at least four international bodies who are saying that there is something wrong with the way that this company is being managed. What do they know that you're not telling us?" Watch the video http://www.bbc.com/news/business-34407665 to hear what Arul has to say. A two minute interview? BBC must have realised he was talking nonsense. He repeatedly said nothing is wrong with 1MDB yet did not see the irony how it requires 'debt rationalisation' and a few of people associated with it are in hiding outised Malaysia! From the interview, he's not telling us anything. With that stupid smile of his, he is not ashamed at all that foreigh authorites and local authorities are investigating 1MDB. Petronas with billions of investment was never been investigated for money laundering. Can you imagine if the Swiss, or the FBI announced they are investigating Petronas for dodgy money transactions? It will be a disaster for Malaysia. And that is what happened with 1MDB. A disaster for Malaysia. It has begun. Najib even said in Buletin Utama just now that he is a strong supporter of TPPA. Thumping his chest how TPPA will be good for Malaysia. The disaster has begun. Something was squeezed and he bent over like a good little coffee boy. "The documents were supplied to various authorities by 1MDB’s CEO Arul Kanda and purported to show Brazen Sky’s statement of account in November 2014. However, the Swiss private bank has told the Singapore authorities that the document did not originate from them and does not represent a true account of the assets of the 1MDB subsidiary. On March 13th this information was reported back to Malaysia. Two days earlier, on March 11th, the Minister of Finance (Prime Minister Najib Razak) had issued a Parliamentary reply to questions from the opposition DAP MP Tony Pua, confirming that the remaining $1.103 billion had already been “redeemed” from Brazen Sky’s alleged off shore fund in the Cayman Islands and stating that it was now being “kept in US currency” at BSI Bank Limited, Singapore. However, separate insider information gained in Singapore has corroborated that there is no actual cash in the relevant Brazan Sky Limited account. “The account merely contains ‘paper assets”, explained a source “the true value of which cannot be determined”. Arul is much better than some of our politicians..i dare say..opposition included..
omg ...tak habis2 lagi ke dgn 1 mdb n the arab donors. boss 1 mdb relek jer....org luar pulak sebok...nak investigate investigate lah...sampai skrg tak de isu pun. 1mdb is just like any other organisation buat biznes ada untung ada rugi...leave it alone. "We have redeemed the cash in the Caymans." "The BSI Bank has cash, whoops assets, whoops units, whoops kena beku pulak". "The 2 billion instalment came from AK, no from the Caymans, no from AK." "We are keeping the money in Singapore because BNM does not allow sums more than $50 million to move across borders." Hahaha...of course not directly from 1MDB but must see how the money has traveled. He answered to questions that were asked. So any problem? Some people have the problem of what Anwar have. They don't believe anything thats true but believe to their unfounded perceptions. All these complain of him not telling. Tell us what you know that he is not telling. 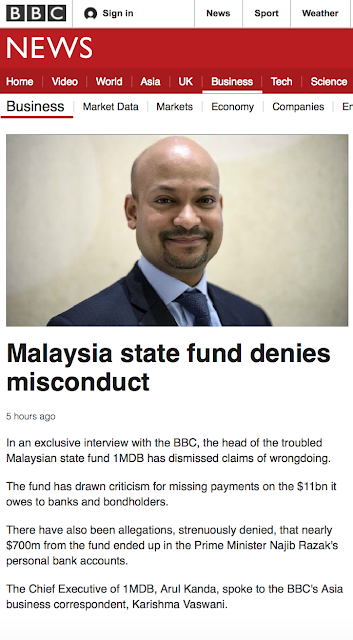 Aren't are suppose to know what you are accusing 1mdb and arul kanda? You know the game is up in Malaysia when a Malay and/or a Chinese won't do the job in government funded fund. That's when they call on Mr Arul. He cannot do anything. If he tries to do, that will be 'racist' 'against Malay ketuanan', 'sedition', etc. The money is not there anymore. If it was, Arul will not be any near this 1MDB. (I often forget what 1MD means - so I remeber it as " 1 Malaysia dah bankrap". Unkind? Perhaps but it helps me remember). If he is not careful, Arul will be swept along with the real masterminds. Do I care? No. Why you all Malaysians have issues with 1MDB. We foreign investors see no wrong with it? Absolutely agree with your statement. Unfortunately these village idiot n latuk himself are the ones making ah jib head bigger and cliser to bringing the nation down..